The Obraztsov Puppet Theatre of Russia, which will be perform on December 4 at 18:30 in the Kamani Auditorium in New Delhi as part of the Festival of Russian Culture in India. The performance by Obraztsov’s Puppet Theatre has been advertised in two languages – English and Hindi, Nana Mgeladze, Advisor for Culture of the Russian Embassy in India told RIR. The early December performances will be staged in two Indian cities New Delhi and Jaipur. In ‘The Unusual Concert,’ the dolls parody artists of different genres. There are singers, dancers and musicians, jugglers and circus trainers. The puppet troupe has travelled to hundreds of cities in Russia and in more than forty foreign countries. It has been performed more than 10,000 times and is listed in the Guinness Book of Records as the world's most famous Russian puppet show of the 21st century. The Obraztsov Puppet Theatre of Russia was founded on September 16, 1931. On September 14, 1981, it obtained its current name - Central Academic Puppet Theatre named after Sergey Obraztsov. The founder of the theatre was a prominent Russian artist, actor, director and writer. He staged 61 plays, including such famous performances as ‘The Unusual Concert,’ ‘Aladdin and the magic lamp,’ ‘At the whisper of your eyelashes,’ ‘The devil's mill,’ ‘Don Juan’ and many others. During eighty years of its existence the Obraztsov Puppet Theatre has turned into a unique Academy of puppet art and a palace of arts for children and their parents. Being one of a kind, the theatre is described in well-known reference-books, dictionaries and encyclopaedias as a national treasure of Russia. Sergey Obraztsov brought up several generations of brilliant actors, directors, scene designers, artists and play writers for puppet shows. All of them are working in hundreds of puppet theatres in Russia and abroad. The Obraztsov Puppet Theatre hosts more than 1500 spectators every day. Moreover, the theatre holds various puppet exhibitions, international puppet festivals, conferences and meetings. 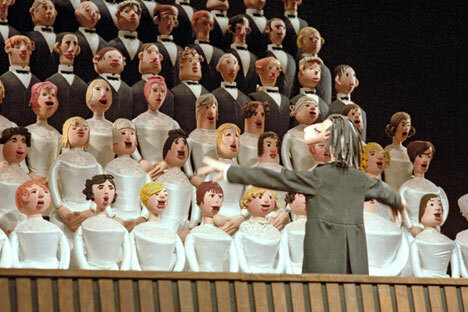 The theatre is a member of UNIMA – The Worldwide Puppetry Organization. The Obraztsov Puppet Theatre tour is not the first performance played by Russian puppet theatres in India. Last year during the Ishara International Puppet Theatre Festival, Russia was represented by the Moscow Regional State Puppet Theatre with their performance of ‘Masha and the Bear.’ The actors performed in New Delhi and Chandigarh at the time. On November 5, the Festival of Russian Culture in India opened with the performance of the Gzhel Moscow State Academic Dance Theatre. Artists from Russia presented a program of Russian folk dance at the Siri Fort Auditorium. It will go on until December 22, and will end with the performance by the Novosibirsk Opera and Ballet Theatre in the Siri Fort Auditorium. More than 100 Russian artists in total will be performing at the Indian festival for almost two months. In 2015, Russia will host the Festival of Indian culture in return, its dates and participants will be determined later.